Summer is my favorite season, and there’s no better time to be in Seattle. The sun is out, the salmon are running and our local produce is at its best. This is also when some of my favorite foods, like fresh blueberries, juicy tomatoes, and sweet corn are plentiful and at their peak of ripeness. Summer is winding down, but the farmer’s markets in Seattle are still in full swing, offering up not only the best produce of the year, but also a place to relax, listen to music, and enjoy an outdoor meal prepared by some of our local mobile-food artisans. There are seven farmer’s markets scattered throughout the city, and each has its own unique environment and variety of vendors. On a recent Thursday afternoon I paid a visit to the Queen Anne neighborhood to check out their market and grab a bite to eat. The usual (tasty) suspects are here. 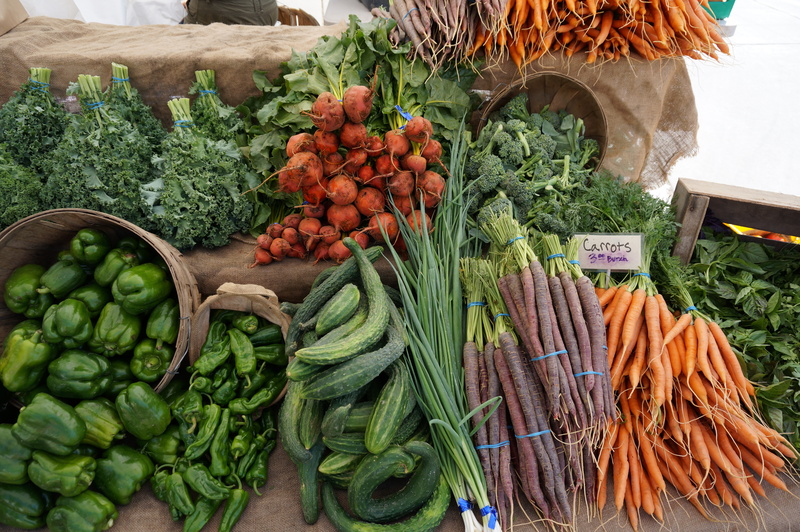 Beautiful produce, fresh-baked bread, locally made artisan cheese, and plenty of food trucks. Eating from a food truck can be tricky if there’s not a place to set your plate, or a comfortable spot to sit and enjoy your meal. Luckily, the market provides plenty of tables and chairs near the food stalls, or you can pull up a blanket and have a picnic on the grass. There’s something to satisfy every taste – with options like wood-fired pizza, shrimp and grits, fresh Mexican tamales, and Indian tandoori. A few clever entrepreneurs have even fashioned their own alternative food vehicles, like Frosene Sacco of Bikelava, who peddles her handcrafted baklava around the city, and the Soda Jerk, who serves fresh, bubbly soda drinks, in flavors like lemon-lavender and rhubarb-ginger. The Queen Anne Farmer’s Market runs every Thursday from 3pm-7pm, June through October. Baklava on a bike – how great is that?! Their lemon-lavender is delicious and refreshing!